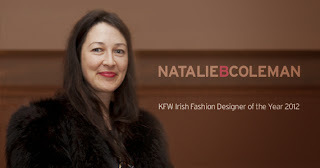 Freaky Smudge: THE FABULOUS NATALIE B COLEMAN! I had the wonderful opportunity of interviewing, via email, the talented Natalie B Coleman. London, moved back to Ireland and was raised in the countryside in Monaghan. 22) Did you always have an interest in fashion, or had you any dreams of pursuing a different profession? I always loved fashion and the emotion of it but thought I might do something more academic when I was still at school. It took me a while to figure out what to do and I still change my mind a lot. 33) Where and when did you receive your first job in fashion after completing your education? 44) How to you get your inspiration? And is there anyone who has inspired you? From everywhere, I design from my personal life so each collection is like a diary page. I read a lot and that inspires me and I get a lot of ideas from art particularly cubism and also films. 55) What is the method of your design process? I write a story first, I have a character or scenario in mind, then I look at fabrics, sketch and then start working on patterns, toiling, returning to patterns and then to production. 66) What does a typical day in the life of Natalie B Coleman involve? Every day is different, I travel a lot with work so if I am in the studio, I am up early, answer emails for a few hours, deal with things like this which there is a lot of and I can’t reply to all but I try to help out as much as possible. Do any press that has to be done, send out pieces for pr. Work on designs, sampling etc. 77) Who are your designs aimed at? 88) How do you prepare for a fashion event/show? Send out invites, work on accessories, model bookings, travel details, appointments with buyers. It depends on the show. 99) Having worked with the likes of THREEASFOUR, Ragna Frodadottir, and Joanne Hynes, how has your experiences with them impacted your own knowledge and style of fashion? I am a very different designer to all of these but I did learn from each of them. 110) What has been the biggest achievement of your career so far, according to you? I have had lots of good things happen and am just pleased to be still in business and growing. 111) Is there anyone from the past or present whose style or choice of clothing/colour has impressed or outraged you? I like Iris Palmer’s style, Dolly Parton, characters from Prisoner Cell Block H, Edith Beauvoir Beale and her daughter from the documentary ‘Grey Gardens’, and Francoise Hardy, plus many more. 112) What has been the funniest or most embarrassing moment in fashion you've witnessed yet? I have not really come across any that have not had an edge of painfulness to them as it is normally something of a disaster to a designer so kinder not to say. 113) Being a womans-wear designer, which male celebrity heart throb would you like to design an outfit for, and what you they wear? I am not interested in doing men’s clothes, I like men in a classic suit. 114) Which fashion week do you prefer and why? London, NYC, Paris, or Milan? Paris, it is the centre of fashion and you still feel the history. 115) Do you have any predictions for what’s to come in A/W 14? I don’t follow trends but I am working on lace with latex, leather, and natural wools. It really is amazing to get an insight into the mind of a fashion designer; someone who inspires others, keeps ahead of the times, creates such magnificent pieces. Designers really put all their emotion and drive into their collections- that's what makes them so great :) Praise fashion, praise designers! This has been your Thursday night from me!